The Virtual Sink: BEHOLD! The KFC Double Down Sandwich! Somewhere at Kentucky Fried Chicken headquarters, some marketing executive is collecting on a bet from some shocked and disgusted coworkers. 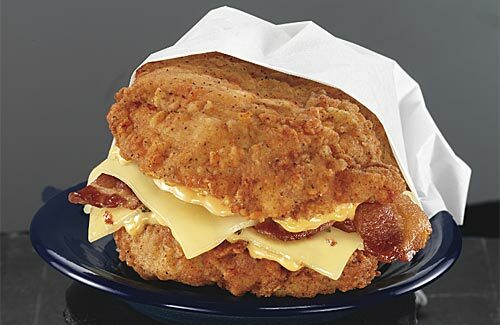 I'm referring, of course, to the new KFC Double Down sandwich. The Double Down is essentially two pieces of boneless chicken (KFC original recipe or grilled) with bacon, swiss cheese, pepper jack cheese and Colonel’s Sauce between them. There is no bun. At times, I think that this is a thing of beauty. I vowed that I would never eat on while sober, but, curiosity got the better of me today and I raced to the local KFC to order a Double Down of my very own. As I waited in line, I felt an anxiety that was not unlike the kind that a man feels when he is waiting in line at a gas station intending to buy the latest issue of Juggies magazine. This feeling is largely due to the backlash this sandwich has been getting from various tofu-farting nutrition activists. If the KFC Double Down had a bun, nobody would be freaking out about it. It would be just double chicken sandwich. Removing the bun freaks people out because it seems more decadent, even though it has fewer calories and carbs than a Big Mac or a footlong from Subway. But how does it taste? I can't lie. IT IS AWESOME! I would have to say that I like it even better than the chicken sandwich at Buffalo Wild Wings. 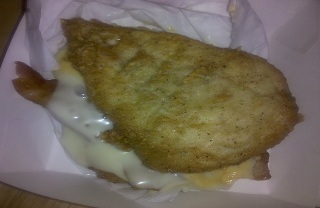 And, although the Double Down is about half the size of a Big Mac, it's twice as filling. After finishing this thing off, I had no desire for any sides. It is, however, very unwieldy. You cannot eat this thing with your hands, so don't even try. You will fail miserably. You need a knife and fork. And it doesn't look a thing like the ads. The ad makes the KFC Double Down look like a thing of beauty. In actuality, it looks like someone microwaved a diaper full of chicken fingers. Still, as I sit here with the Double Down slowly clogging my arteries, all I can think to say in response is: OM NOM NOM NOM NOM NOM!!!!!!! I'm having a heart attack just looking at it.